Japanese entertainment company, Konami Holdings Corp., released a new skill based title that was launched at the iconic MGM Grand in Paradise, Nevada earlier this year. The Konami title Frogger: Get Hoppin' is aimed at attracting a new demographic of players to the casino. With the new generation of youth not interested in traditional slot machines or table games, casinos have started several new initiatives to redirect the gambling dollars back to their premises. One of the newer trends is to bring skill based gaming to the Las Vegas casino floors. This new trend continues with the latest edition of Frogger by Konami. Those who grew up in the 80's will be quick to point out the first Frogger game that was then released on the Atari. The premise of the original game involved the protagonist, a green pixelated frog, trying to cross a busy road. This was easier said than as a handful of hazards were thrown into the mix to make the journey increasingly difficult. Konami’s newest edition, Frogger: Get Hoppin', aims to capitalised on the nostalgia from the older players while introducing something interactive for the newer generation. The game was debuted at the Global Gaming Expo late in 2016. Konami said that the title was one of the “top skill based concepts” in the market right now. The developers of the both the Frogger titles, have combined authentic sounds from the classic version of the game with the iconic road- crossing course for the new edition. The casino floor version of the game features a 15 second race that allows players to increase scores and earn cash prizes. The game also features a three level standalone progressive jackpot; as well as a bonus wheel spin. Frogger: Get Hoppin' has set the bar very high for other skill- based casino game developers. The game has been launched under the Nevada Gaming Control Board's New Innovation Beta programme. This initiative allows developers and operators to conduct field trials of game content and concept. Thus, allowing them the chance to tweak the game and cater it to the taste of the customer before releasing a full blown version. 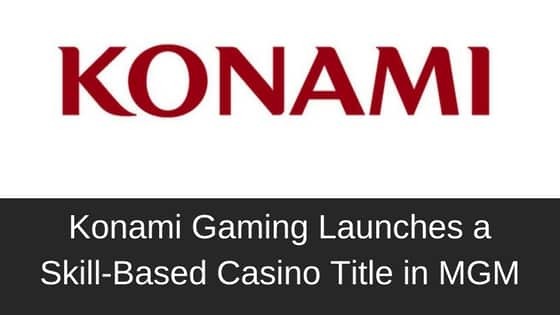 Konami happens to be the first supplier to be approved by the Nevada Gaming Control Board. They also have the distinct honour of being the first company to successfully introduce a skill- based game to a Las Vegas casino floor. Frogged: Get Hoppin' is currently being trialled at MGM Grand Las Vegas. To be more specific, the game can be accessed at MGM’s new Level UP Entertainment lounge. This space, which is a hybrid between a service bar, a gaming lounge and an arcade, opened its doors to the public in 2016. The aim of the bar is simple, to attract new, younger players by creating a space that offers innovate products alongside traditional bar sports such as pool. As a company, Konami has been synonymous with video arcade and gambling games. These were factors that were vital in its decision to enter the casino skill gaming arena. Executive Vice President and Chief Commercial Officer at Konami Holdings Corp., Tom Jingoli, said that they were excited about this new direction in video game development. He said, “[We are] excited to bring that creativity and technology to the gaming industry in new ways and help pioneer the development of next generation gaming products,” He also added that programs such as the New Innovation Beta program in Nevada, allowed developers the unique opportunity to test the waters before releasing their titles to the public. The field trial of skill- based games sees Las Vegas playing catch up to Atlantic City. AC, the gaming hub of the East Coast, already had the foresight of introducing skill based gaming to their casinos a while back. As a result, you will already be able to find such games live in four New Jersey casinos. Konami Holdings Corporations, better known as just Konami is a giant in the Japanese entertainment industry. It is involved in the creation and supply of numerous gaming products including trading cards, anime, slot machines and arcade cabinets. They made a name for themselves by producing several popular video game titles in the 1980’s, including hits such as the Metal Gear Series that was introduced in 1987 and is still being produced to this day. Founded in 1969 as a jukebox rental and repair business, Konami has grown to mammoth proportions with offices in Tokyo, California and Sydney. As of March 2016, the company owns 21 consolidated subsidiaries around the world. This is indeed quite an achievement for company chairman, Kagemasa Kozuki, who managed to create a global empire from humble beginnings.